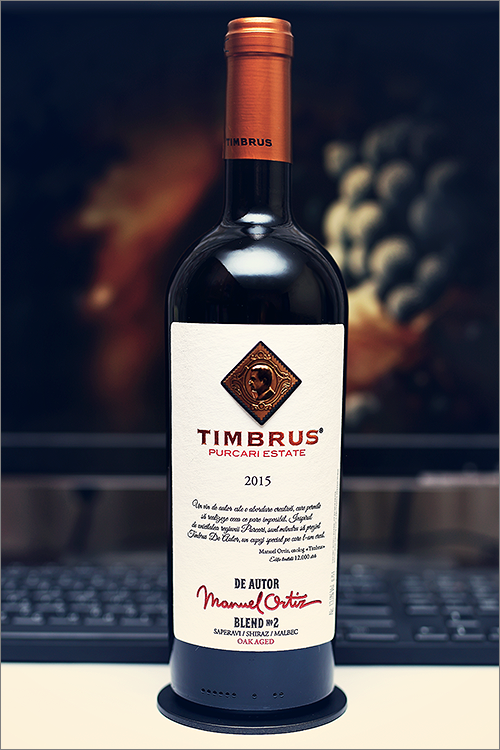 The wine we are going to review tonight is a special one – De Autor Blend No.2 2015 by Timbrus. This is the winemaker’s flagship wine – a blend of saperavi, syrah and malbec, produced in the famous Purcari micro-region in the south-east of Moldova and signed by Manuel Vicente Ortiz Martinez – the renown spanish oenologist. This is the successor of the De Autor 2014 wine and, as is the norm for this class of wines, it has been aged for 16 months in french oak barrels, followed by a long maturation period in the bottle, but let’s not put too much emphasis on the theory. Without further ado, let’s get on to the tasting! Deep and noble garnet color, with pale and elegant ruby hues towards the rim of the glass. The nose is strong, filled mostly with black and red fruits flavours: red bell pepper, beetroot, fermented apple, overripe black mulberry, ripe blackberry, ripe sour cherry, blackcurrant, overripe black plum, black mulberry jam, black plum jam, cherry tree wood and leather. An instant later the nose is filled with notes of black pepper, roasted oakwood, black tea, nutmeg and some subtle hints of black soil. The wine is dry, with high alcohol level, strong acidity and ripe tannin. It feels savory, acrid and seedy, with an opulent and austere body. This is a quite tart, a bit woody yet fruity wine, as it tastes leafy-green and aggressive, with delicate earthy hints on the mouthfeel. The wine has a fair overall balance, with nuanced seediness on the palate and overwhelming acidity. It has a medium-plus finish and quite green, acrid-tart aftertaste. This is definitely a fine Wine of Moldova and the overall rating says the same, with 90.2 points scored it is right there, among the best wines we’ve tasted so far. Please click on the chart icon on the left in order to get to the wine rating page, where you can find all the wines we’ve tasted to date. Conclusion: this is a very nice wine blend that is quite a bit off its balance – clearly on the rise, as it requires a couple more years of bottle ageing (2 to 3 years should be enough) before it will reach the summit of its prime form. Overall the wine feels austere and tastes acrid at the moment, which a clear signs of youthfulness, this is why, if you’ll decide to ignore our recommendation and uncork it today rather than tomorrow, keep in mind that you’ll need to counter-balance all the acidity in the wine with lots of natural fat, therefore we would suggest to pair this wine with a filet mignon steak with creamy mushroom sauce or a ribeye steak with red wine reduction sauce. Cheers!